Zhou Yusong is known as the “Guardian of Dogs” in his home city of Zhengzhou, China’s Henan Province. The kindhearted man has spent the last 8 years of his life rescuing stray dogs and offering them a home at his animal protection center. It all started in 2008, when Zhou Yusong, when he noticed an injured stray dog by the side of a road in Zhengzhou. It had been hit by a car and was fighting for his life, but everyone just ignored it. Unable to do the same, he picked up the canine and took it to a nearby pet hospital. After saving the animal’s life, he took it to a dog shelter, as he had no way of taking care of it himself, in his small apartment. Shocked by the large number of stray dogs already at the shelter, he became more involved in trying to make their lives easier, and started donating 200 yuan ($30) every month, for the animal’s food and medical treatments. Feeling like he wasn’t doing enough, Zhou Yusong convinced one of his friends to invest 800,000 yuan ($122,000) in a new animal rescue center, on the banks of the Yellow River, just outside Zhengzhou. He agreed, and let Zhou in charge of running it. The animal lover was happy to do it, and actually quit his job so he could dedicate all his time to caring for the dogs. According to Xwtoutiao, Zhou Yusong has rescued over 700 stray dogs, as well as other small and medium size animals, in the last 8 years. He hasn’t taken a single vacation during that time, spending nearly three thousand days and night at his rescue center, making sure that the animals were well taken care of. 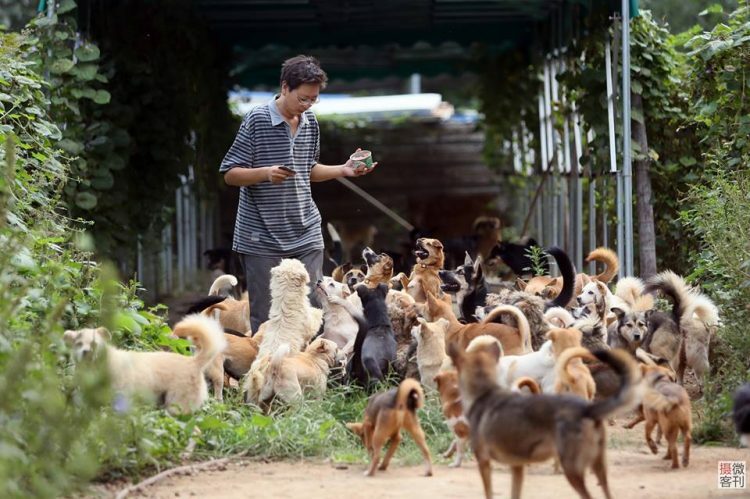 Zhou spends his days feeding the dogs, cleaning up their kennels, administering them various medical treatments and separating them so that they don’t fight among themselves. In order to save money, he takes care of all the maintenance work himself, fixing fences, trimming the neighboring bushes and whatever else is required. It’s a busy schedule, but he still finds the time to give his beloved dogs a short massage or at least pet their heads to let them know he cares. Zhou has long been known as “Guardian of Dogs” among like-minded animal lovers in Zhengzhou, but recently gained the admiration of millions, after photos of him and his hundreds of dogs went viral on social media this week.